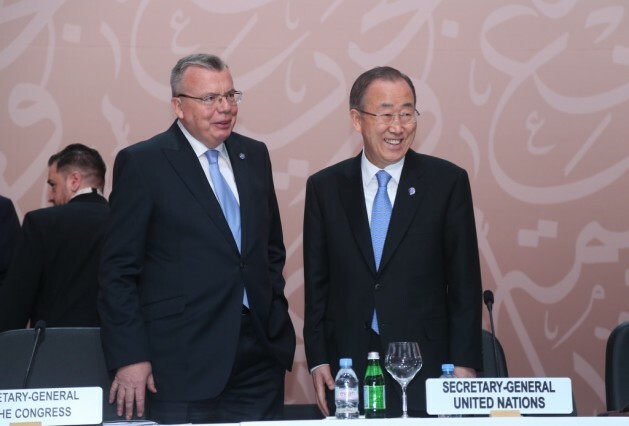 The words are those of U.N. Office on Drugs and Crime (UNODC) Executive Director Yury Fedotov, who was speaking at the closing of the 24th Session of the Commission on Crime Prevention and Criminal Justice (Crime Commission) held in the Austrian capital from May 18-22. Earlier this month, IPS Editor-in-Chief Ramesh Jaura interviewed Fedotov on how the challenges facing the United Nations’ drugs and crime agency translate into challenges on the sustainable development front. Q. The United Nations Office on Drugs and Crime (UNODC), established in 1997, understands itself as “a global leader in the fight against illicit drugs and international crime”. At the same time, you have taken up the cudgels on behalf of sustainable development. What role does the UNODC envisage for itself in achieving sustainable development goals to be agreed at the U.N. summit to adopt the post-2015 development agenda in September? A. Crime steals from countries, families and communities and hampers development while exacerbating inequality and violence, especially in vulnerable countries. Trafficking in diamonds and precious metals, for instance, diverts resources from countries that desperately need the income. The share of citizens experiencing bribery at least once in a year is over 50 percent in some low-income countries. Many detected human trafficking movements are directed from poor areas to more affluent ones. Research also suggests that weak rule of law is connected to lower levels of economic development. These are just some of the many challenges that the international community faces around the world that are related to crime. UNODC’s broad mandate includes stopping human traffickers and migrant smugglers, as well as tackling illicit drugs. It encompasses promoting health and alternative livelihoods and involves battling corruption, illicit financial flows, money laundering and terrorist financing. Our work confronts emerging and re-emerging crimes, including wildlife and forest crime, and cybercrime, among others, all of which hinder sustainable development. Currently the United Nations is making the transition from the Millennium Development Goals (MDGs) to the Sustainable Development Goals (SDGs). In Goal 16, the Open Working Group, responsible for identifying the development goals stressed the need to promote peaceful and inclusive societies for sustainable development, and to provide access to justice for all, as well as building effective, accountable and inclusive institutions. Justice is also one of the six essential elements identified by the Secretary-General in his own Synthesis Report on this subject. Goal 3, which focuses on “ensuring healthy lives”, underlines the importance of strengthening prevention and treatment of substance abuse. These goals – justice and health – go to the very heart of UNODC’s mission. I am hopeful that when the U.N. Heads of State Summit on Sustainable Development in September 2015 takes place these goals will remain. Q. UNODC organised its Thirteenth Congress on Crime Prevention and Criminal Justice from Apr. 12 to 19 in Doha, Qatar. The 13-page Doha Declaration contains recommendations on how the rule of law can protect and promote sustainable development. Is that the reason that you described Doha as a “point of departure”? A. The Doha Declaration was passed by acclamation at the 13th Congress on Crime Prevention and Criminal Justice, and contains crucial recommendations on how the rule of law can protect and promote sustainable development. The declaration is driven by the principle that these issues are mutually reinforcing and that crime prevention and criminal justice should be integrated into the wider U.N. system. At the 24th Session of the Commission on Crime Prevention and Criminal Justice (May 18-22), there were nine resolutions before the Commission and they pave the way for the Doha Declaration to go before the U.N. General Assembly and ECOSOC for approval. The other resolutions, for instance on cultural property and standard rules on the treatment of prisoners, seek to implement the principles of the Doha Declaration. It is for this reason that I described the 13th Crime Congress in Doha as a significant “point of departure”. Doha is the first, but not the last step in the process of implementing the Declaration and ensuring that we turn fine words into spirited and dedicated action in the areas of crime prevention and criminal justice – action that can benefit the millions of victims of crime, illicit drugs, corruption and terrorism. If we do this, we have an opportunity to energise the 60-year legacy of Crime Congresses and give it the power to shape how we tackle crime and promote development for many years to come. Indeed, I see a strong, visible thread between the recent Crime Congress, September’s UN Summit on Sustainable Development and the 14th Crime Congress in Japan in five years’ time. Q. The Doha Declaration also pleads for integrating crime prevention and criminal justice into the wider United Nations agenda. This suggestion comes at a point in time when the United Nations is turning 70. Are there some issues which the United Nations has ignored until now or is there a range of issues that have emerged over previous decades? A. Member States are increasingly affected by organised crime, corruption, violence and terrorism. These challenges undercut good governance and the rule of law, threatening security, development and people’s lives. Sustainable development can be safeguarded through fair, human and effective crime prevention and criminal justice systems as a central component of the rule of law. As stated by U.N. Secretary-General Ban Ki-moon: “There is no peace without development; there is no development without peace; and there is no lasting peace and sustainable development without respect for human rights.” We need to break down the walls between these activities and integrate the various approaches. UNODC is well placed to assist. We work closely with regional entities, partner countries, multilateral and bilateral bodies, civil society, academia and the private sector to support the work on development. We can also offer our support at the global, regional, and local levels, through our headquarters and network of field offices. Q. Do you find willingness on the part of all countries around the world to agree on national, regional and international legal instruments, to combat all forms of crime, and their willingness to pull on the same string when it comes to implementation? A. Our work is founded on the U.N. Convention against Transnational Organised Crime and its three protocols, the Convention against Corruption, international drug control conventions, universal legal instruments against terrorism and U.N. standards and norms on crime prevention and criminal justice. Almost all of these international instruments have been universally ratified by the international community. Why? Because countries recognise that crime today is too big, too powerful, too profitable for any one country to handle alone. Countries recognise that, today, crime not only crosses country borders, but regional borders. It is a global problem that warrants comprehensive, integrated global solutions. The UNODC approach to this unique challenge is threefold. First, we are building political commitment among Member States. Second, we deliver our activities through our integrated regional programmes across the world. Third, we are working with partners, both within and outside the United Nations, to ensure that our delivery is strongly connected to other activities at the field level. In support of this action, and to give just one example, UNODC is networking the networks. Today’s criminals have widespread networks and vast resources; if we are to successfully confront them, we need to ensure greater cross-border cooperation, information sharing and tracking of criminal proceeds. The initiative is part of an interregional drug control approach developed by UNODC to stem illicit drug trafficking from Afghanistan and focuses on promoting closer cooperation between existing law enforcement coordination centres and platforms. Q. UNODC has assigned itself a wide range of tasks. Which are your priorities in the biennium ending this year, during which you have 760.1 million dollars at your disposal? A. I would mention two matters that are of international importance. First, smuggling of migrants not just in the Mediterranean or the Andaman seas, but also elsewhere. We are witnessing unprecedented movements of people across the globe, the largest since the Second World War. People are leaving because of conflict, insecurity and the desire for a better life. They are falling into the arms of unscrupulous smugglers and many of them are dying, while trying to make the dangerous journey across deserts and seas. Second, the nexus of transnational organised crime and terrorism is a major threat to global peace and security, and has been recognised as such in recent Security Council resolutions. Every extremist and terrorist group requires sustainable funding. The most reliable, and sometimes the only, means of achieving this is through illicit funds gained from transnational organised crime, including cybercrime, drug trafficking, people smuggling and many other crimes. Information on the magnitude and exact nature of such relationships remains incomplete, and more research is needed. Based on data and analysis, however, for some regions, we can follow the funding in support of violent extremism and terrorism. In Afghanistan, for example, the Taliban could be receiving as much as 200 million dollars annually as a tax on the drug lords. By far the most abused substance on the planet is money. Stopping its abuse through fair and reasonable banking and taxation practices and property and inheritance laws would go a long, long way toward diminishing the abuse of other substances. As well, governments need to recognize and acknowledge that certain substances, used responsibly, respectfully and under proper guidance, have sacramental value in facilitating and enhancing spiritual development. But first, those governments need to admit that there is such a thing as spiritual development.